Turn an ordinary bottle of WINE into an extraordinary bottle of WINE! 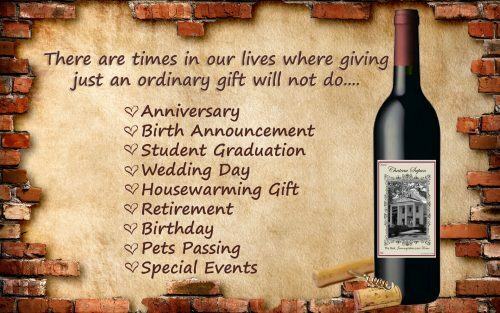 There are times in our lives where giving just an ordinary gift will not do, mom and dads 50th anniversary, your child’s graduation, your wedding day, the occasions are endless. Our unique personalized wine labels from “Wines From The Heart” consist of a full custom design. You supply us with the photo and we transform that into a gift people will be raving about for years to come. These perfect gifts are designed to make magical memories last a lifetime. 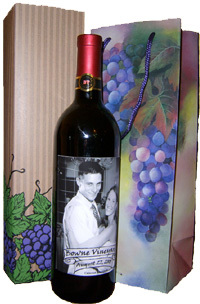 Wines From The Heart offers personalized wine labels, wine bottle labels, custom labels and personalized labels that create the perfect gift ideas for birthdays, anniversaries, graduations, weddings, wedding favors, holidays, congratulations, house warming gifts, real estate, pets, business or any special event or occasion. Our personalized labels make perfect gifts that can be given as personal gifts or corporate gifts. Custom Made Wine Bottle Labels To Create That Special Message. All of our wine labels are custom made at time of order to suit your individual needs! Each photo is submitted by the client and is transformed into a Unique, Top Quality, Professionally Created, Exquisitely Rendered Work of Art. Your label will be personalized with your sentiments and details of the recipients special occasion. Follow a few easy steps and in minutes you will have helped create a true work of art straight from the heart. Our elegant custom designed labels will create beautiful personalized wedding and party favors, food or craft gifts, birthday and birth announcements. These gifts will be much appreciated and remembered. You can serve your personalized labels to guests at dinner parties, or give customized hostess gift when you visit friends. Wines from the Heart provides a total customized label. We work directly with our clients via email and telephone to guarantee they receive a one of a kind work of art.